Published Nov 30, 2015 by Sams. Part of the LiveLessons series. This complete video course shows you how to participate in the Cloud through Hyper-V and Remote Desktop Services. Hands-on skills for real-world success! The IT world is changing very quickly: it seems like every day, more IT infrastructure and applications move to “The Cloud.” This easy video course is designed to help you master all the skills you need to participate in this trend using Microsoft’s Hyper-V and Remote Desktop Services. 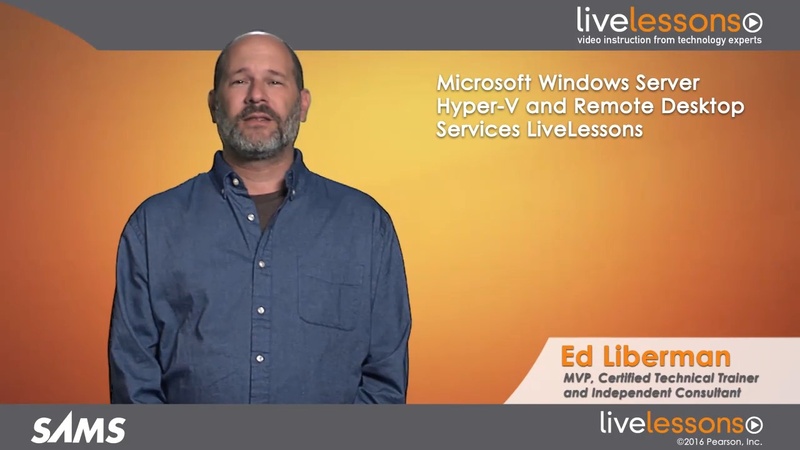 World-class networking instructor and consultant Ed Liberman starts by introducing the absolute basics of Microsoft Hyper-V virtualization, and each type of virtualization available to you. Next, he guides you through the basics of installing and configuring Hyper-V for your unique environment and your specific requirements for scalability and availability. You’ll walk through using key tools such as the Hyper-V Manager and Best Practices Analyzer; enforcing security; and creating virtual machines, virtual hard disks, checkpoints, and virtual switches. Liberman concludes by showing how to implement high availability and redundancy using network load balancing and clustering and how to move virtual machines to maintain maximum flexibility and performance. Discover what you’ll need to know about Windows Server virtualization, and how this course will help you master it quickly and efficiently. Understand and compare each type of virtualization, including server, desktop, network, user state, and presentation virtualization. Install Microsoft server platforms with Hyper-V; review considerations for VM scalability, disks, storage, and networking; provide high availability; and install the Hyper-V role. Work with the Hyper-V Manager; streamline management with PowerShell; manage Hyper-V in a workgroup; use the Hyper-V Best Practices Analyzer; and understand the Hyper-V Security Model. Review and configure Hyper-V settings. Understand NUMA and Enhanced Session Mode. Create virtual hard disks: set storage options; choose virtual disk formats, using fixed size and/or dynamically expanding VHDs; use differencing; work with directly attached disks; and establish VHD sharing. Understand and compare Generation 1 and 2 Virtual Machines (VMs); create a VM; configure VM settings; and work with Dynamic Memory, Smart Paging, and Integration Services. Understand, create, and manage Checkpoints, and use VM Generation IDs. Understand the essentials and types of Hyper-V Virtual Switches, and use Microsoft’s Virtual Switch Manager. Understand High Availability concepts; provide for redundancy in Windows Server 2012 R2 and Hyper-V; use network load balancing and clustering; and establish high availability at the application level. Review your options for moving VMs and migrating storage; use the Move Wizard; move VM storage; perform live migration; and even move a running VM. What is Enhanced Session Mode?